What is Weigh Down at Home? In the Weigh Down at Home series, Gwen Shamblin, M.S.R.D. revolutionizes the weight loss industry by redefining the issues involved in weight loss and permanent weight control. She completely reverses the traditional focus on counting calories and fat grams and instead focuses the viewer on God, who created the body and the rules by which to feed it. She has proven her theory through the powerful testimonies of hundreds of participants of the Weigh Down Ministries Exodus Out of Egypt Online Classes and is now able to bring them to you in Weigh Down at Home. Learn the Truth as it is presented in this life-changing program and break free from the chains of slavery to food forever. If you love what you are learning on this site for FREE and you would like to own your own copy of the workbook, you can order it through the link below. CLICK TO ORDER YOUR OWN WORKBOOK! Get A Copy on DVD Today! 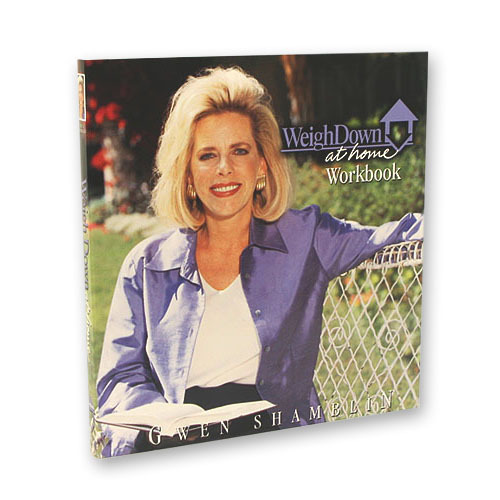 If you have enjoyed watching the free online videos and reading the supplemental material found on this site, you can also purchase a full set of Weigh Down at Home DVDs from our STORE! In addition to 12 video lessons, each set has 6 audio lessons, a workbook and the two very popular pocket guides "How to Eat Your Favorite Foods" and "Pocket Temptation Guide".